- Degrease blade with acetone. 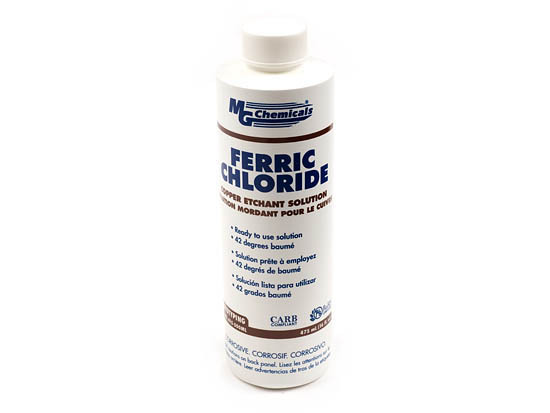 - Mix ferric chloride with distilled water (one part water, two parts acid) -OR- mix 60% ferric chloride and 40% white vinegar. Carefully pour solution into plastic (or pyrex) dish (some folks also use a PVC Pipe that has been sealed on one end as a container for etching). - Submerge the blade in the acid mixture, and let sit for a few minutes. - Remove to see the etched pattern. - Rinse the blade with warm water and (if you want a deeper etch) put it back in the acid until the desired etched depth is achieved. - Etching time required depends on how deep you want the etch to be and what kind of contrast you want. - Dry the blade off, and wipe down with WD-40. You can also sand off the oxidation with 600 grit wet/dry sandpaper, if desired.